I haven't posted a printable in a very long time so I thought Mother's Day would be just the right occasion. Mother's Day is very special but why limit the card or note giving to just that day? You (ok we!) have no excuses with this simple design. You can send you awesome Mom a quick message any time of the year. The PDF has 8 pages (I couldn't decide between raspberry/pink and orange so I included both. 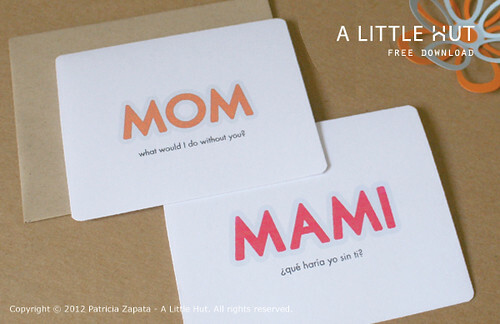 I also included options in English (mom and mum) and Spanish (mami and mamá). All you need to do is cut the card out (outline included) and fold it in half (optional - I used the We R Memory Keepers Corner Chomper on my printouts). You can download the entire PDF (just delete the pages you don't need) right here. For those of you that have cutting machines... I'll be posting cutting files for the "Mom" titles tomorrow.